What cuts worse, the knife or the cold? Sultry Russian Natalia Kassle was chosen to join the Danger Girl team for her phenomenal combat and espionage talent among more obvious outstanding attributes. As a former intelligence officer of the Russian army, Natalia often supplies the Danger Girls with crucial hindsight [sic] to the Hammer Empire's plethora of aging war criminals and international gangsters. Kassle is widely recognized for her mastery of edged weapons and specialized dexterity in the art of knife combat. Natalia is seldom seen with anything other than her multitude of knives. When a mission deems it necessary, Natalia will take advantage of the massive M-82 .50 cal. sniper rifle. 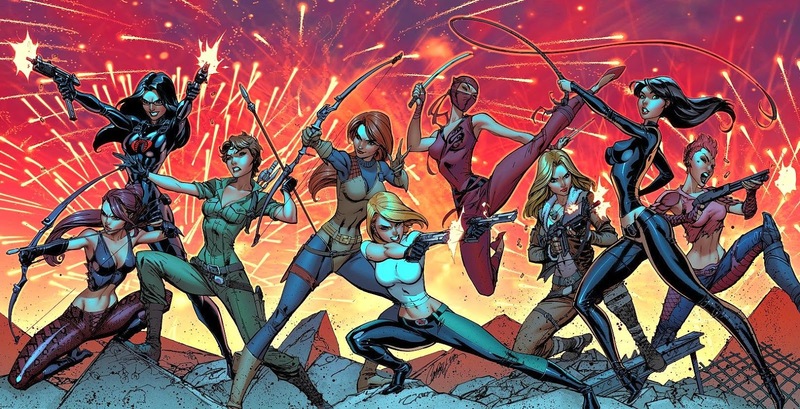 Creator J. Scott Campbell is a fan of GI Joe, which is why these Danger Girl toys all have Joe-style filecards on the back. They really give us more info about the paper-thin characters, too. I mean, Natalia Kassle did undergo some pretty significant changes during the comic's run, but her characterization was still basically "she's Russian." Natalia has the narrowest face of any of the Danger Girls - that's the way she was drawn, and that's the way McFarlane's uncredited sculptors made her. Despite JSC's design notes specifically stating that her hair falls over her face on the opposite side from Abbey's, it doesn't - her long hair bunches up on her right shoulder. He also described her as "the most physically fit of the Danger Girls, with a bit more muscle definition," but that doesn't seem to have made it to the toy, either - she's got the same thin, curvy body as the other girls, though you can see more of it. See, she's used to cold weather, so she wears a purple bikini top under a fishnet belly shirt. And yes, that's a real fishnet shirt slipped over the figure's torso. This is much better than trying to sculpt netting on and get it painted accurately. Her pants are baggy and wrinkled, and there are laces all the way up her boots (which is a feature seen on Travis Charest's variant cover for issue 3). She's also got the most reserved pose, just sort of standing there with her arms crossed. Her articulation is a bit better than the rest of the team: like the rest, she has swivel joints at the hips, waist, wrists, shoulders and neck. The neck is stuck fast on mine, but it's meant to move, so we're counting it. But beyond all that, she also has swivel biceps, which both give her fishnet sleeves a place to be held on, and allow her to brandish her weapons. As mentioned on her filecard bio thingie, Natalia is the team's resident Knife Nut - in the comic, her introductory splash page shows her hitting a target dead-center over and over with them, and this toy's pose is taken from that page. She's armed with two knives that can be held in her fists, though one of them really only fits if she's holding it backwards (with the blade pointed toward herself instead of her enemy). There's a small knife on her hip, one in her boot, and six strapped to her thigh. None of those are removable, though. Like the contemporary Tomb Raider: Adventures of Lara Croft sets, the Danger Girl figures came with ornate display bases. 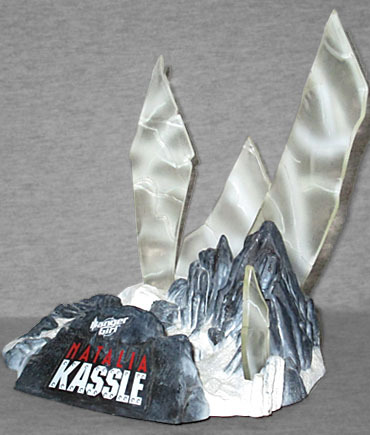 Natalia's is a chunk of snowy mountain with four giant ice shards jutting up out of it - they're made from clear plastic, and have white streaks airbrushed on them. Dark grey rock is exposed where the snow has blown away, and there are two sunken footprints exactly where Natalia is meant to stand. Also footpegs. But she stands fine by herself, thanks to her plain pose - much better than her two teammates, at the very least. The base was, like the rest of the figure, designed by Campbell. It's kind of a shame that there was only ever one series of Danger Girl figures - in addition to the fact that it means we never got figures of Sean Connery Deuce, Bruce Campbell Johnny Baracuda, or even the other actual member of the team, Silicon Valerie, we could have gotten a second Natalia Kassle wearing her... alternate outfit. Missed opportunity, McToys!